6th Grade The Water Cycle! Click the photo to watch the interactive image. Click on the image to view how the Hawaiian Islands were formed. Use your talking to the text graphic organizer as you read through this information. Google Maps can be used to show the Plate Tectonic Features of the planet Earth. Go to Google Maps and check it out for yourself! "By using a super-computer to virtually squeeze and heat iron-bearing minerals under conditions that would have existed when the Earth crystallized from an ocean of magma to its solid form ago, two UC Davis geochemists have produced the first picture of how different isotopes of iron were initially distributed in the solid Earth." Directions: Explore websites while filling out chart on how each has changed earth’s surface. Use the statements and the pictures to create a graphic organizer of what you have learned. 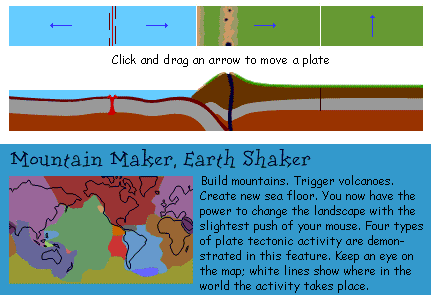 Go to the following site and play Landform Detectives! I discovered this quite by accident once when Google Maps had just added the Satellite Pictures to their site. Go try it yourself: Go to the middle of the Atlantic Ocean. Click on Satellite. Do you see the Mid-Atlantic Ridge System? What Google's done here is spectacular! You can show your kids the bottom of the ocean! You can show them the Mid-Atlantic Ridge! The Mariana Trench in the Pacific Ocean where the Pacific Plate is subducting under the Eurasian Plate. 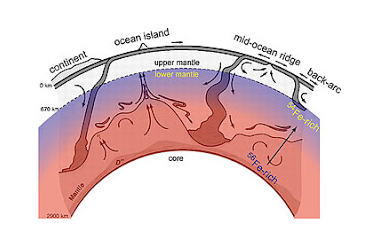 The Juan de Fuca plate as it subducts under the North American Plate. The Andes Mountains where the Nazca Plate is subducting under the South American Plate. Northern India where the Indo-Australian Plate is Colliding with the Eurasian Plate, thus forming the Himalayan Mountains. Iceland where two plates are moving apart, splitting Iceland in half. NOTE: When in Iceland, click on Terrain, which shows where the glaciers "should" be. Then click back on "Satellite" to show how much is actually left. Astounding. Go to Hawaii. Show them how most of the Hawaiian Islands are undersea volcanoes formed by the Pacific Plate moving over a Hot Spot. Click on "More" on the upper-right hand area and see Photos or Wiki entries. Now, if you have a projection system hooked up to a Smartboard or big screen, you have just an ideal setup! When I've done this, my students were absolutely glued to the screen! They loved it. Only thing is: be prepared for them to ask to see their own homes! NOTE: The YouTube video at the beginning of this blog entry is not from Google Maps, of course, but shows the ocean as it appears on Google Maps. This video would also be a great teacher tool!Project this on your Smartboard/Big Screen! Let it play to the end and then "surf/browse" along the bottom for all sorts of great videos, including one called, "Approaching a Trench." Directions: Complete this online lab. There are 3 types of plate boundaries and a fourth called a “plate boundary zone” in which the type of plate boundary is not clearly defined. 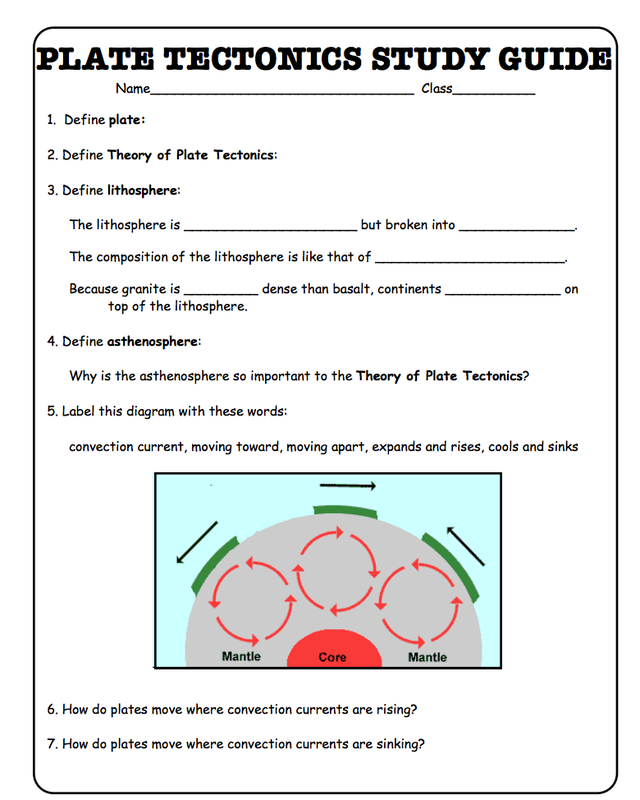 and learn about the three types of plate boundaries and answer the questions below. 1. What are the three types of plate boundaries? 3. What is a spreading center and what is made at one? 4. Name one spreading center (or divergent plate boundary). 5. 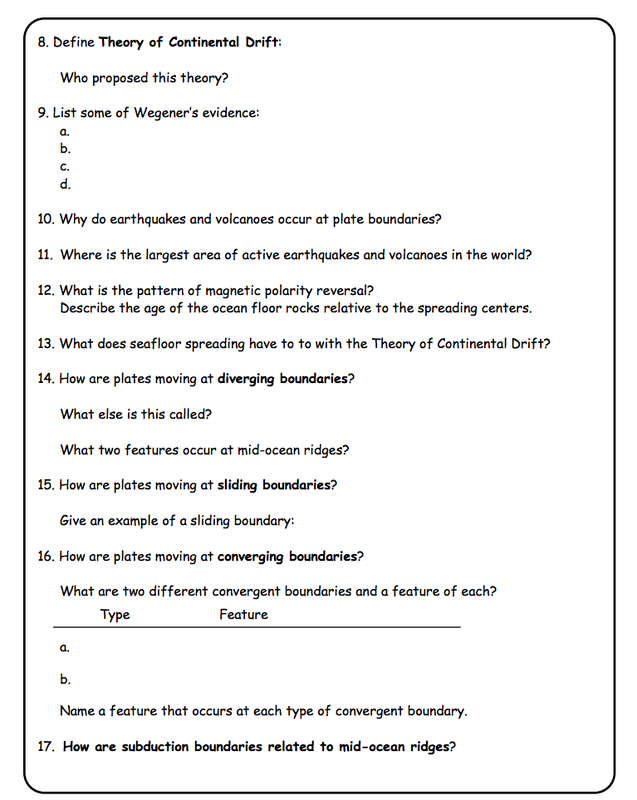 What are the three types of convergent plate boundaries? 6. What two kinds of crust are involved in a subduction zone? 8. 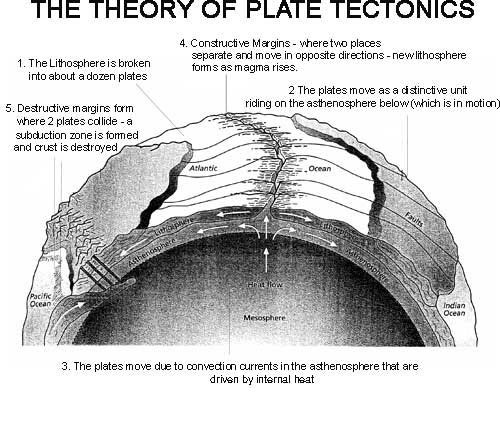 What happens along a transform plate boundary? 9. Name a famous transform fault in western North America. 11. Drag each of the arrows in the activity to see the plate interactions. 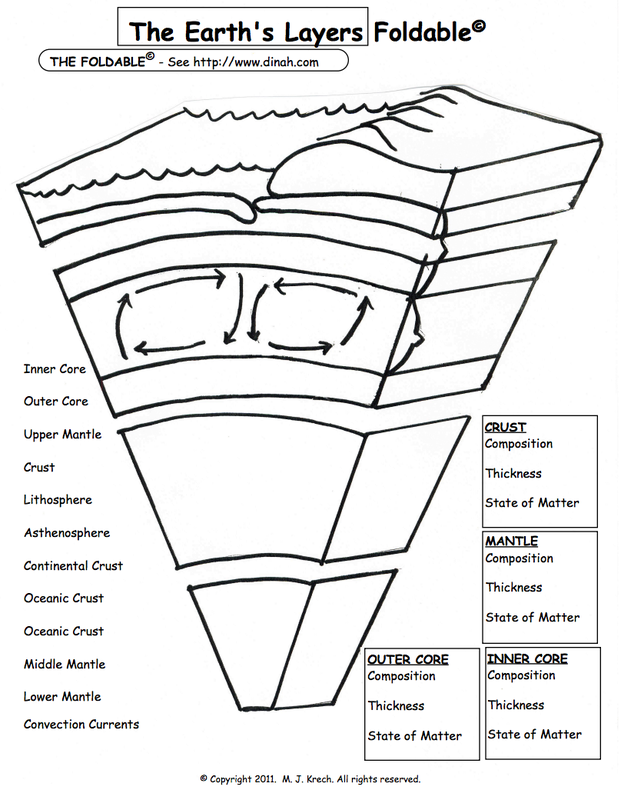 List from left toright each type of plate boundary shown in the activity. and scroll down to the “Seafloor Spreading” picture. Click on the picture. Wait a few seconds for it to load, and there should be a movie. 13. What is the red line? and click on the picture labeled “Subduction”. Wait for it to load. There should be another movie. 14. What two kinds of convergence are shown in the movie? and youwill see a plate tectonic map of the world. Rest the mouse on the bottom right corner of the map and after a couple of seconds an enlargement icon should appear. Click on this icon to see the map in full size. Now you can use the scroll bars on the side and bottom to maneuver around the map. Wait for the movie to download. This is a movie showing how the plates looked around 150 million years ago, when all the continents were together forming the “supercontinent” Pangea, and how the plates moved through time to their present configuration. 18. What continents did North America used to be attached to during Pangea time? Go to the following site to view what happens to the land as a glacier advances. Click on the pictures in this website to read more about the effects of weathering on rocks. Directions: Use the information found in the interactive website below to answer the following questions. 2. What is mechanical weathering? 3. What forms of mechanical weathering do you see in the interactive? 4. How did frost wedging work? 5. How does exfoliation work? 6. How did thermal expansion work? 7. How did crystal growth work? 8. How did the tree roots cause erosion? 9. How does abrasion work? 10. What is chemical weathering? 11. How does dissolution work? 13. How does hydrolysis work? Rocks! A video that looks at the three main types of rock and the very different ways in which they're formed! Directions: Use Websites 1 and 2 to answer questions on web quest worksheet. After you have finished play the study jams movie (#3) and take the quiz. Make sure to record your score. Directions: Explore other cycles on earth then answer the questions below on a line sheet of paper. 1. Summarize the carbon cycle in 25 words. 2. Summarize the nitrogen cycle in 25 words. 3. How are these other cycles similar and different from the rock cycle. 4. Click "Game Up" to play the rick identification game we played together in class. 2. 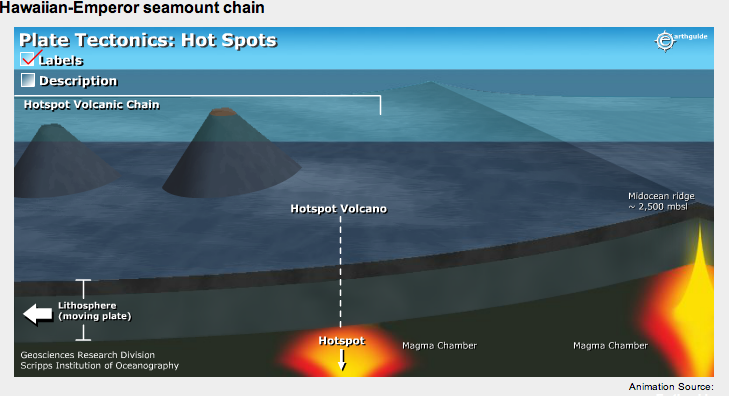 Match the part of the rock cycle to the image in the diagram--Try to beat your score. Play at least 5 times. 2. 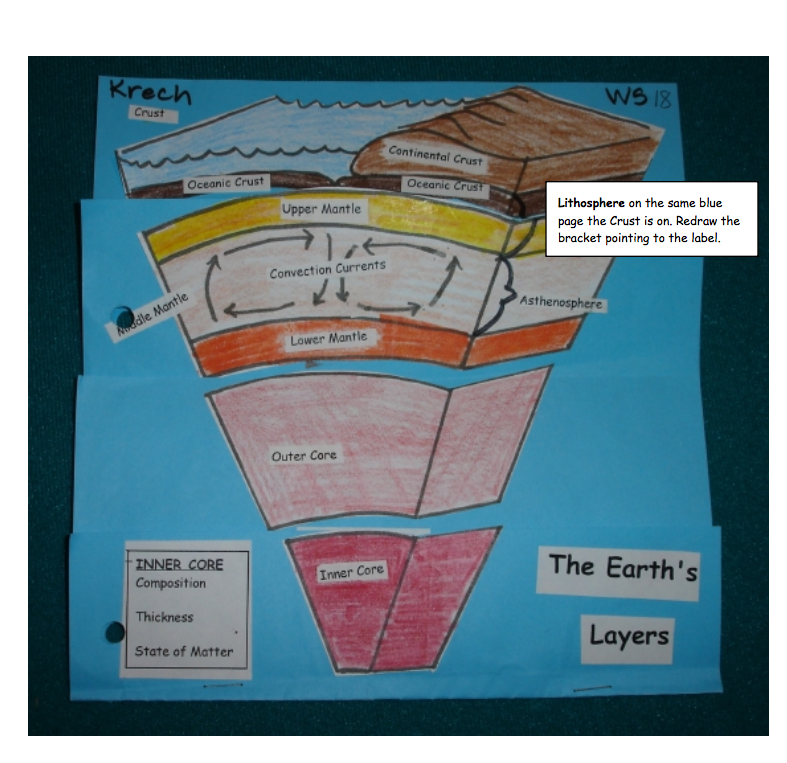 Drag the images to the correct placement in the rock cycle. 2. Click through the list of games and explore each of them. The Following Igneous Rock Key may help you out. Read about Igneous Rocks and answer the following questions. 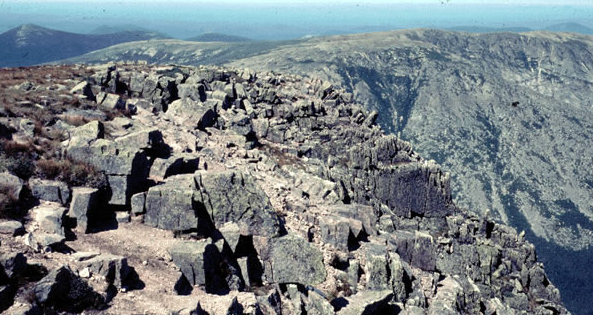 How are the rocks that cooled slowly underground (gabbro, diorite, and granite) similar? How are the rocks that cooled at the surface (basalt, andesite, and rhyolite) similar? Obsidian is volcanic glass. It doesn't have any minerals in it even though it contains all the elements that make up minerals. How is this possible? What cooled faster, granite or rhyolite? What cooled more slowly, basalt or gabbro? What can you learn about the cooling history of an igneous rock based on the size of its crystals? A rock with a porphyritic texture has large crystals "floating" in small crystals. Describe the cooling history of such a rock. string of volcanoes on the edge of a continent. Read about Metamorphic Rocks and answer the following questions. Compare and contrast the two main types of metamorphism. Describe how to recognize the two main texture groups of metamorphic rocks. Describe the three changes to rock that occur during metamorphism. Explain how "high grade" and "low grade" metamorphic rocks differ. Explain how an "index" mineral can be useful. Explain how the parent rock affects a resulting metamorphic rock. Explain what agents (forces) cause metamorphism. List metamorphic rock types based on the presence or absence of foliation. The first rock you see is the sedimentary rock, shale. As you walk you notice the rock has become rather shiny and you see flecks of biotite mica in the rock. The shale here was metamorphosed. After a several kilometers you notice the rock now has a grainy appearance and you start seeing garnets in the rock. Distracted by the beautiful mountain scenery you forget to notice the rock for the next km or two. When you think about the rocks again you see that you are now climbing on granite. In terms of agents of metamorphism, types of metamorphism and index minerals, describe what you have seen. Hint: draw a picture or diagram of the bedrock seen during your walk. Breccia is a name for rock composed of sharp fragments in a matrix of (or surrounded by) finely ground rock. Explain why that would make sense for the metamorphic rock found at a fault. From the graph, provide the range of temperatures and pressures that can be found in subduction zones of convergent plate boundaries? From the graph, provide the range of temperatures and pressures that can be found in zones of igneous intrusion at convergent plate boundaries? Read about Sedimentary Rocks and answer the following questions. Imagine you are a paleontologist; a person who studies extinct plants and animals. Would you rather go looking for fossils in an area where the bed rock was mostly basalt or mostly sandstone? Explain your choice. Describe the two types of sedimentary rock. Clastic rocks are made of rock and mineral fragments. List the three categories of those fragments in order from the largest to the smallest fragment sizes. What is a chemical precipitate? Of the two types of sedimentary rocks, which is the most useful for human society? Why do you think this? 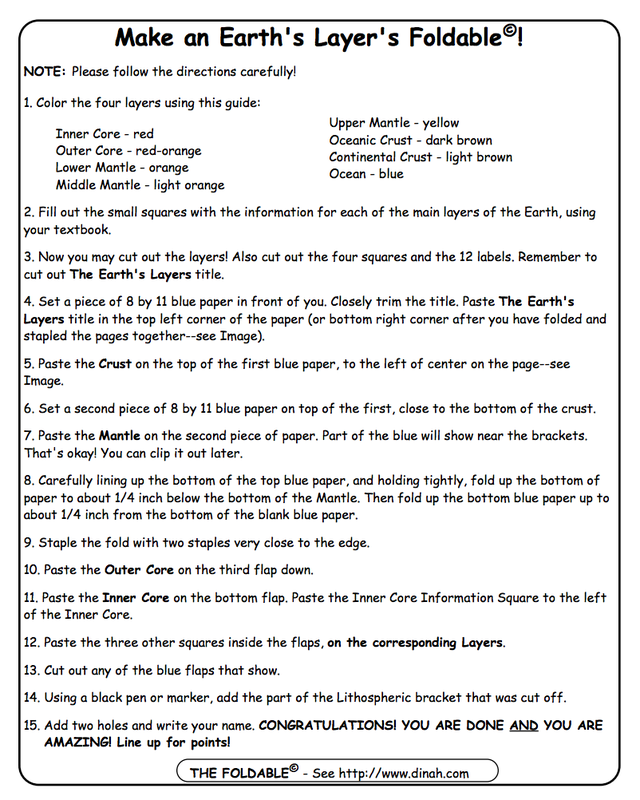 List the steps for forming a sedimentary rock. Describe an effect of industrialized human society that has increased chemical weathering. Fourteen thousand years ago what agent of erosion was hard at work in Western Washington state? Describe the agents of erosion that are now at work here. Sediments from floods are often not well sorted. Explain why that is. How is lithification different from freezing? List the two processes of lithification. Of these which is the most important? Why are sedimentary rocks overly represented on the continents? Hint: what is the hydrological system and what about mineral density? Write your answers on a lined piece of paper.